Dr. Haider Warraich is a young and brilliant new voice in the conversation about death and dying started by Dr. Sherwin Nuland and Atul Gawande. Dr. Warraich takes a broader look at how we die today, from the cellular level up to the very definition of death itself. 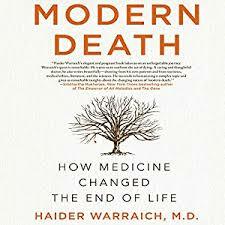 Dr. Warraich’s debut book, Modern Death:How Medicine Changed the End of Life, explores the rituals and language of dying that have developed in the last century, and how modern technology has not only changed the hows, whens, and wheres of death, but the what of death.